We are an award-winning luxury bed and breakfast in Midcoast Maine. Relax in the tranquility of our 4.5 lush acres and enjoy breathtaking waterfront views. From your room, an adirondack chair in our garden or the table on our deck, you might catch the sunrise over the Kennebec, seals playing on the island out front or eagles swooping from the tall trees. Or you might take in the stars and Milky Way while toasting s'mores around our fire pit. Just a few minutes away, you'll find Popham Beach, boating, light house tours, fishing, hiking, beaches, golf, restaurants, museums, shopping and more. We're just 10 minutes from charming Bath, 25 minutes from Bowdoin College and Brunswick, 50 minutes from Portland and halfway between Boston and Acadia. We pride ourselves in our thoughtful and attentive hospitality and gourmet, farm-to-table meals. 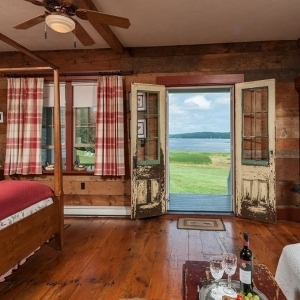 For an authentic Maine experience that is truly unforgettable, come to the 1774 Inn. Please stay in touch! For news, recipes and special offers, please sign up.